Are you big fan of seafood? How about a little comparison between clams and oysters? Both clam and oyster are bivalves – shellfish with two part shell and two muscles. They have been around over 500 million years ago. People have been eating them for at least 165000 years. Although both belong to the Mollusk class and similar in a variety of ways, there are a plenty of differences between them. Did you know that clams are usually live in fresh water, more mobile and move around on their muscle foot burying themselves in the mud or sand under the water? On the other hand, oysters live in salt water. Except for first weeks of their initial stages, when oysters still have a muscle foot, they are mainly attached to the same spot such a hard surface or a rock in the water for the entire life. They prefer to stay to the water surface and we can easily notice them on the mud when it is low tide. Clam has a shiny and smooth shell, whereas oysters shell is more calcified and rough. Both are used as a food in many countries, but preferred one is clam due to its taste and tenderness. Besides, oysters are known for producing pearls, while calms do not. Pearl is formed, when oyster produces nacre, the mix of calcium and protein, against the foreign matter trapped in the shell. In today’s competitive food market, shellfish take one of the major places due to their nutritional content. Despite the fact that both clam and oyster are a goldmine of essential substances, let’s compare their nutritional content. You can easily notice from the charts below that oyster is enormously richer in Copper and Zinc, considerably richer in Iron and Magnesium, and lower in Sodium. On the other side, claim is richer in Phosphorus, Potassium and Calcium. Thus, oyster wins in this content. From the viewpoint of vitamins claim is undoubted winner. 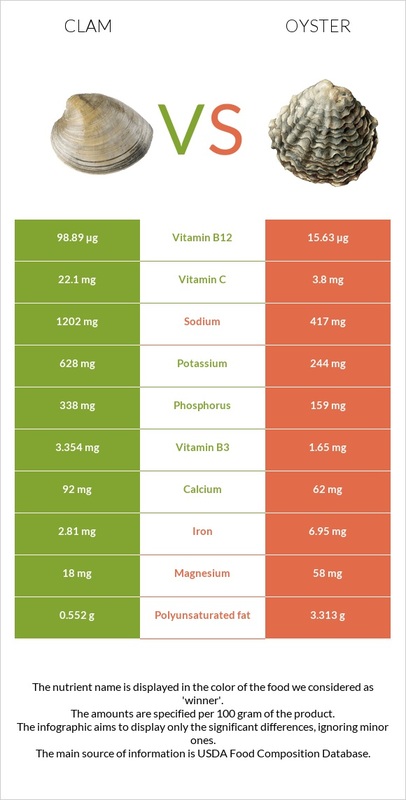 It is drastically higher in Vitamin B12 and Vitamin C, fairly higher in Vitamin B2, Vitamin B3, and slightly higher in Vitamin B5, Vitamin B6 and Vitamin A. However oyster is higher in folic acid. Amount of Vitamin B1 is equal. In this part claim is medal-holder again with its higher concentration of protein, lower content of saturated fats, cholesterol and carbohydrates. High levels of Zinc in oysters contribute to good eyesight by ensuring adequate pigmentation in the retina, skin, nail and hair reparation by creating and boosting collagen. It is worth mentioning the role of Zinc in right function of immune system and cell growth. Zinc also prevents against inflammation as an antioxidant. In addition, Zinc is essential for the sexual health, because it plays great role in a proper formation and development of germ cells, in production of sexual hormones. On the other hand, clams with high content of Calcium, and Phosphorus protect against osteoporosis. Clam is higher in Vitamin B12, which prevents against Megaloblastic anemia and neurodegenerative diseases like Alzheimer’s disease. Clam is richer enough in Vitamin C that famous for its anti-inflammatory and antioxidant properties. In contrast, oyster is higher in Folic acid (Vitamin B9), which is essential for prospective parents, because it has a great value in a right formation of germ cells, development of embryo’s brain, especially during the first trimester of pregnancy. Besides, folic acid reduces the levels of homocysteine in the blood, high levels of which contribute to formation of atherosclerotic plaques and damage of blood vessels, increasing by this way the risk of heart attack. From the very start it is necessary to point out that clams and oysters are filter-feeders, which means they use their gills to filter water and collect nutrients. So depends on where they have been harvested, there is a risk to pick up bacteria and viruses. In this connection it should be noted that by eating raw or undercooked clams and oysters we can put us at risk for such serious states as Paralytic, Neurotoxic, Diarrheic and Amnesic shellfish poisonings, infections caused by several strains of Vibrio bacteria, Norovirus. According to the USA Centers for Disease control and prevention (CDC), in the United States, Norovirus is the leading cause of medically attended gastroenteritis in young children and outbreaks of gastroenteritis; it is estimated to cause 19–21 million illnesses a year and approximately 50% of all food-borne disease outbreaks (1). According to the CDC report, in the United States Vibiro parahaemolyticus is the cause of about 35000 domestically acquired food-borne infections annually, the most of which is associated with consumption of raw or undercooked shellfish (2). According to the study (3) published in December 2013, pre-birth maternal shellfish consumption at least once a month is associated with a higher risk of food allergy before age 2. It follows logically from what has been said that correct harvesting, cooking and storing of clams and oysters are crucial, otherwise we run the risk of serious health-threatening, even prior to death. It must be pointed out that both clam and oyster should be harvested by catching them alive. Clams and oysters are both eaten in a variety of ways. Although calms can be eaten raw or steamed on a half shell, they are most often eaten as a component of a more complex dish. The most popular dishes containing calms are New England clam chowder, linguine with clam sauce and Spanish paella. On the other hand, eating raw oysters on the native shell at many fine restaurants is a great enjoy for gourmands. Despite this, oysters may be used cooked, smoked or frozen, canned. How to store clam and oyster? Here the important point is to store them alive again. The storing conditions of clam and oyster are similar. According to the Washington State department of Health (4) both of them should be stored in the refrigerator in an open container to ensure them air circulation. They must be covered with damp towel to maintain humidity. It is not allowed to store them in a water to avoid of their death or spoiling. Shells must be closed, if they are open and don’t close after tapping, shellfish are dead and we need to get rid of them. By this way clams can be stored alive up for to 7 days outside of the water, oysters up for 2-3 weeks. But it is highly recommend eating them as soon as possible. The cooked shellfish should be kept for up to 2 day in the refrigerator and up to 3 months in the freezer. So, in conclusion, as you can see from the charts below oyster is richer in mineral content, especially in Zinc and Copper. In contrast, clam is the winner in terms of vitamins, particularly with Vitamins of group B. Both food are widely consumed, moreover, oysters are used in peals production. It is very important to choose right places to enjoy them to avoid fatal results. Besides, oysters and clams can be sources of allergy and intoxication for people with reduced immune system, especially for children and pregnant women. Enjoy them and don’t ignore the related hazards.